Senator Ben Cardin (D-MD): To continue on clean water for one moment, we’ve had significant problems with safe drinking water and clean water. Let me ask you a preliminary question: Do you believe there is any safe level of lead that can be taken into the human body, particularly a young person? 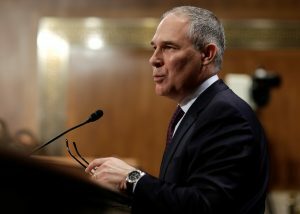 Pruitt: Senator, that’s something I’ve not reviewed, nor know about. I would be very concerned about any level of lead going into the drinking water, or obviously human consumption. I’ve not looked into the scientific research on that. Pruitt’s statement that he would be concerned about “any level” of lead ingestion reflects the existing consensus. Both the CDC and the EPA say on their websites that there is no level of lead known to be safe in a child’s bloodstream. So that’s why the CDC relies on a “reference level” of 5 micrograms of lead per deciliter of blood to identify which children under age six have an elevated level of blood. That’s been the standard since 2012. Before that, the “level of concern” was 10 micrograms of lead per deciliter of blood. The change reflects increasing awareness about the damage that can be caused by even tiny levels of lead in the blood. And the threshold may still be shifting. Reuters reported a few weeks ago that the CDC was considering lowing the threshold by 30 percent — down to 3.5 micrograms of lead per deciliter of blood — at a meeting scheduled for earlier this week. The CDC did not immediately respond to STAT’s request for comment Wednesday afternoon on the outcome of that meeting. All of which is to say: Pruitt probably deserves some slack on this point. We don’t know what level of lead is safe to be taken into children’s bodies, or if there even is such a threshold. And the level that warrants regulatory action is actively being debated. But still, the critical tweets keep coming. This article is reproduced with permission from STAT. It was first published on Jan. 18, 2017. Find the original story here.